I'm so happy to be joining A Jillian Vance Design team!! Thank you Bunny and Jillian for having me! Before I share my cards, I'd like to share a little about me. I live in Florida along with my husband and our four kids. I started scrapbooking in 2003/2004?...let's just say, a long time ago. lol Shortly after though, I found my true passion to be in making cards. You can find more of my creations at my blog, Simply Sweet Greetings. My style is typically CAS, though sometimes I like to mix it up a little bit. When I'm not making cards or taking care of the million other daily things, you can find me at the beach! I hope you enjoy all the things I share with you! Okay, now for my cards! I made two cards using some of the new goodies! 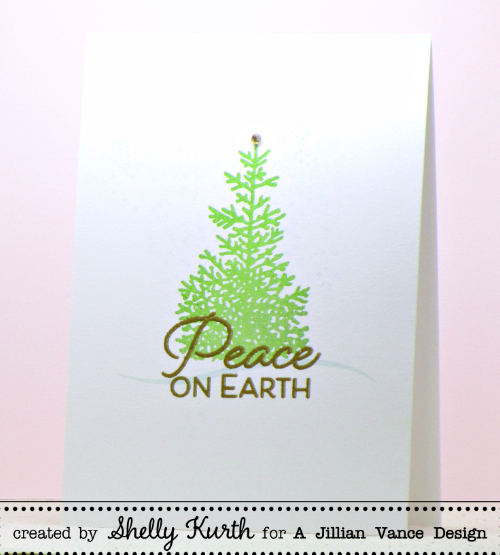 So for my first card, I used the Mini Pines stamp set along with the Scattered Snow background stamp. For my background, I randomly inked up the scattered snow background, just adding ink where I wanted it, and then stamped it on my card base. Once done, I added my tree and did some heat embossing with the sentiment in gold. And to finish everything off, I added one little gold rhinestone to the top of my tree. 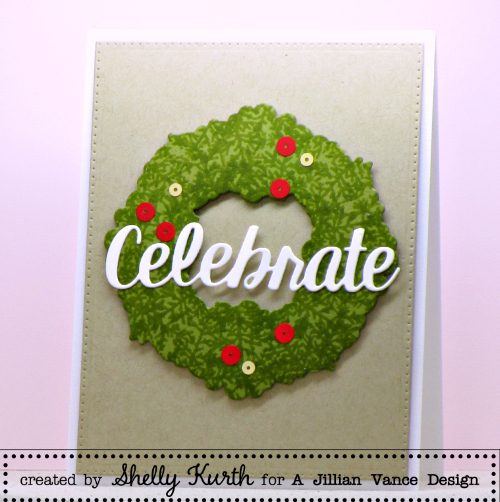 Now, for my next card, I used only the Mini Pines stamp set along with the Wreath, Celebrate, and Polka Dot Rectangle dies. I wanted to try something a little 'outside of the box'. So I played around with a few different things and ended up with this. I used the wreath die with some green cardstock. 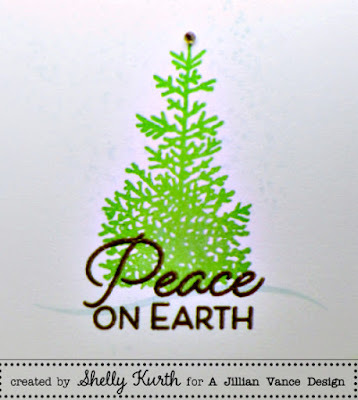 Then used the mini pines stamp with a green ink and randomly stamped the 'tops' of the trees on the wreath die cut piece. Once I liked how it looked, I added some sequins here and there, as well as some foam tape on the back. 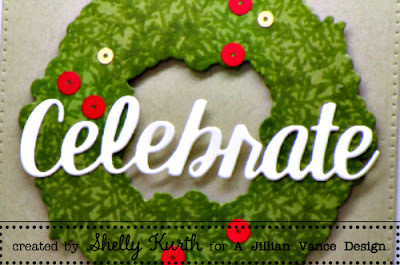 After, I used the 'celebrate' die with some white cardstock and added it to my wreath. I was going to just add my wreath to my card, but decided to use the polka dot rectangle die with kraft cardstock and then added it to my white base. Wonderful projects! Congratulations on your new 'gig'! YAY!!! So excited to see you are now on the team, shelly!! your cards are amazing!! Congratulations, Shelly! So excited for you - and for us, who get to revel in your abundant creativity with these products! Win-win all around! Your debut cards: fabulous!! Two awesome cards, Shelly! Congrats on joining the DT! yay Shelly.. your cards are gorgeous.. Welcome Shelly! I love your beautiful cards!! !